I bet all role players have one. Their own version of a dice container. I was wondering as I drove to Costa this morning for a coffee while I wrote this waffle (other coffee shops are available) [Side note, I didn’t even get a hello from the barista this morning – he didn’t even ask for my order – guess I have upset someone – again! ], where my own dice container was. I do remember it, it is a salted peanut tin with the yellow plastic lid. There was so many dice in the tin that the yellow lid has split and they were all kept in with an additional elastic band. I’ve seen some people have posh velvet pouches, as if their were some rich merchant from the medieval streets or even arrive at the game with their dice in their pocket, just to be brought out onto the table accompanied with some odd pieces of change and that white, fluffy remains of a once over used tissue. In the days of no internet and/or Twitch, our RPG sessions always took place on our dining room table and, although many people still play there – not on my dining room table but their own – many people play online now sharing their experiences and exploits with the masses. With the creation of Roll20 and Hero Lab (think it is called this, but not familiar with it) the application itself rolls the virtual dice for everyone to see. But should we be using these virtual dice or staying true to the physical dice of olden days? There is something quite exciting, rolling a physical dice for that moment when the death saving throw actually means life or death and watching it roll and clatter across the table before resting on a 20 or a 1. Everyone had a range of different dice and spend hours painting them or varnishing them. I remember the lovely ‘gem’ ones (actually glass) which looked nice but I could never read them at all! My favourite set of dice were actually the ones which came with the Basic D&D set – their were a dull buff colour and quite small, but I really liked them. And as for the d6 – well wasn’t it a special moment when you had to collect everyone’s dice to roll for the damage of that devastating fireball spell! With some of the games I play, the number of dice needed to be rolled would almost seem to be impractical now. 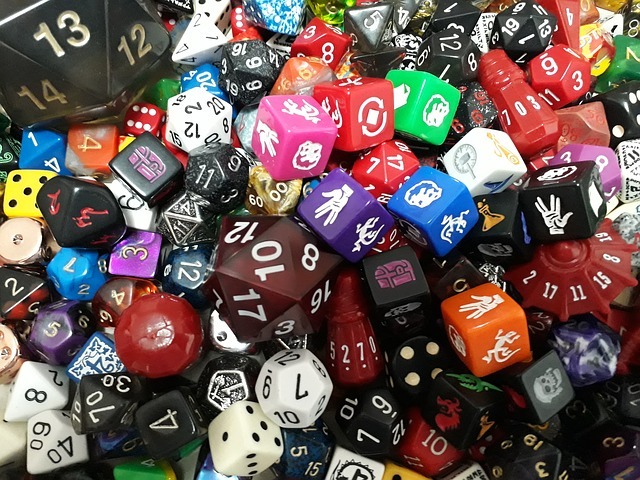 Within Shadowrun, there are times when the number of dice are regularly above ten and in many games the ‘rolling’ of these dice in the real world have been replaced by shaking a load of d6s in a plastic container. At these times, I value the virtual system not only for its ability to roll multiple dice quickly and to count up the successes, but also because the virtual system rolls multiple tasks at the same time. An example of this would be spell casting when the dice are rolled for the casting and the drain at the same time and presented in a simple, easy to read form. Some people have remained true to their dice rolling roots and even now roll dice within their virtual games, rather than using the system. I have no problems with this at all, although I would like to see the dice rolls. Maybe this is because I am a DM and always wish to verify what people have got, or maybe it is because I want to see how close or above the players get, but I feel there is something missing from the game when the dice rolls are just reported. I was watching a game once, a really good game with an excellent DM, where I felt that the ‘hidden’ dice rolls were rolling according to the situation. When needed the rolls appeared to be very high while at other times they were lower. Initially I thought this was just my interpretation, but some people in the chat also commented. I guess that it comes down to what type of player you are – something which I have waffled about before – if you want everything to be successful then enjoy, I like those moments that I fail, just as much as those moments when I succeed. For me, I would always like to see the dice roll, whether this be virtual or physical – mainly because I want to enjoy those ‘phew’ moments. I don’t think the virtual systems of Roll20 have removed anything from the dice rolling, I think they have provided more access to the masses. Yes, if I was playing on a table top, I would probably enjoy getting my dice out again and using them, including that one which always seemed to roll a ‘6’! But I think gaming has moved on somewhat and that if we are sharing our experience with others online then we should be sharing those dice rolls with them as well. 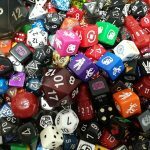 So to answer the question, to dice or not to dice – well definitely share those dice rolls although whether their are physical dice or virtual replicas either is fine. And with that, let’s all grab our initiative dice and roll to see who goes first….